Probably not. We use a crawler that does something like “readability” to extract text. I suspect SVGs will not work. SVGs are essential to my application since it is about data visualisation, is there any way I can make this work? The relevant code is here. It uses ruby-readability as a base library. If you have the time and know your way around ruby, you could dig into how it works and see what’s involved in getting SVGs to work. Is there any way to embed the statistics frame form the admin panel like a post somewhere else? If yes, how can this be accomplished? There is no way to embed anything like that right now. You would be better off using the API and creating such a feature yourself. Can I also apply styling to the embedded content from the custom CSS/HTML settings at /admin/customize/css_html ? I know this is an old question but have you found a solution to reverse the order of the embedded posts? Has this functionality been implemented since? I am trying to use a hidden topic that I embed on my website as a mean to publish some news. I found this recent topic on the matter which for now does not get much attention so I am trying here as well. I also wonder how to make the embedded iframe scrollable. Any idea? If you set this up correctly, the first time you visit http://example.com/blog/entry-123.html it will try to load comments for the blog post. Since there are none, it will tell the Discourse forum to create a new topic in the background. A new topic will be created by eviltrout and the contents of the first post will be crawled from your blog and the text will be extracted automatically. Is there a way to create the topic, only when someone actually posts a comment? I have thousands of blog posts. this way It would spam my forum. Any Idea or suggestion for my situation? BTW, It is also not compatible with RTL language. Is it possible to delete the extracted text from the first post? I seem unable to do this. I can only delete the text above the “Show Full Post” button but not the contents of the Post themselves. Forgive me if it’s already been answered or asked / suggested but I couldn’t find it… If there’s a topic with a large number of replies, how do we restrict the number that are displayed and then offer a “Read More” kind of thing…? That what the second setting in the embed page does: Maximum number of posts to embed. Hello. 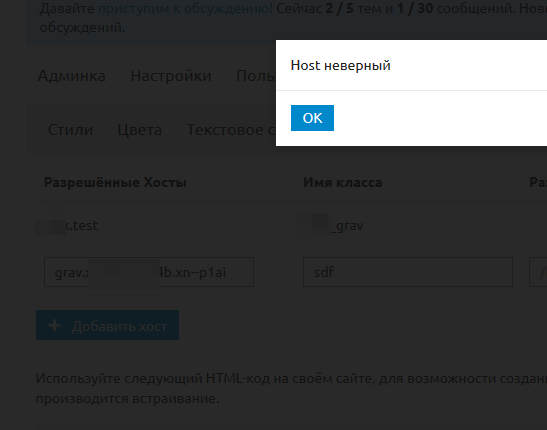 I cannot add cyrillic domain as hostname to allowed hosts. I think the problem might have been that I used the “system” user as the poster for embedded topics (not sure if that’s allowed), or maybe I just didn’t wait long enough. I changed it to my username and checked back some time later, and now I have topics! However, I am getting an error when trying to actually display the comments: the response is a 404 not found (with an X-Frame-Options header set to SAMEORIGIN, so it displays nothing but I can see it in the console). So having read through pretty much everything in this thread, and having implemented the embedding of topics into our blog, we’re seeing a reduction in engagement because people have to first sign into the forum in order to comment. Any ideas on how others are dealing with this? I get the concern here, when you are mega popular the extra barrier is actually a huge benefit, but when you are not the most popular person in the room you really want to reduce all the barriers for participation. The good old “enter email”, “enter comment” form is significantly less barrier than signing up to another site with all that it implies. That said this is not an area we explored quite yet, we are working on improving the review queue at the moment. I think if the review queue is solid enough this is an experiment I would consider running on my blog. I would not expect any big announcements here though for the next year or so. because people have to first sign into the forum in order to comment. Any ideas on how others are dealing with this? Honestly if login free on-page commenting is your highest priority, I recommend you do not use Discourse. Yeah, that’s what I am thinking as well.